Paolo DeMaria, Ohio Department of Education Superintendent, delivers recommendations to change the high school graduation requirements before the State Board of Education. 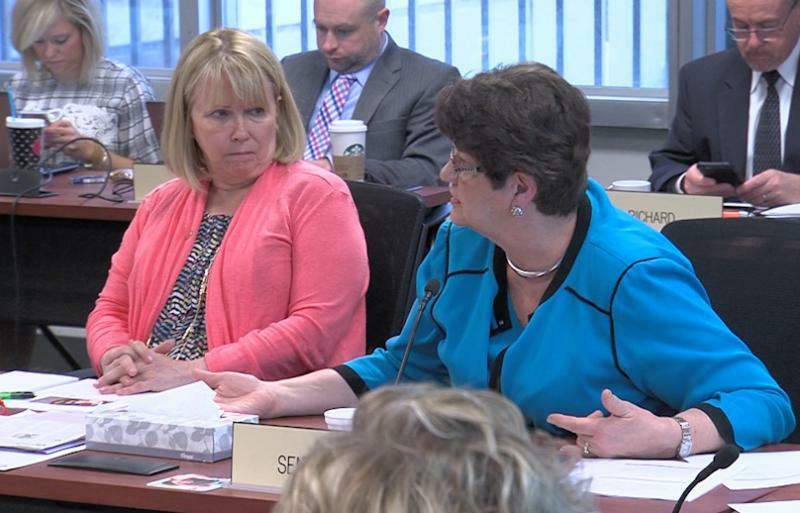 Sen. Peggy Lehner (R-Kettering) offers her opinions on the recommended graduation requirement changes during the State Board of Education meeting. Chad Aldis, The Fordham Institute, prepares his remarks outside of the State Board of Education meeting room. He will deliver testimony opposing the recommended changes. 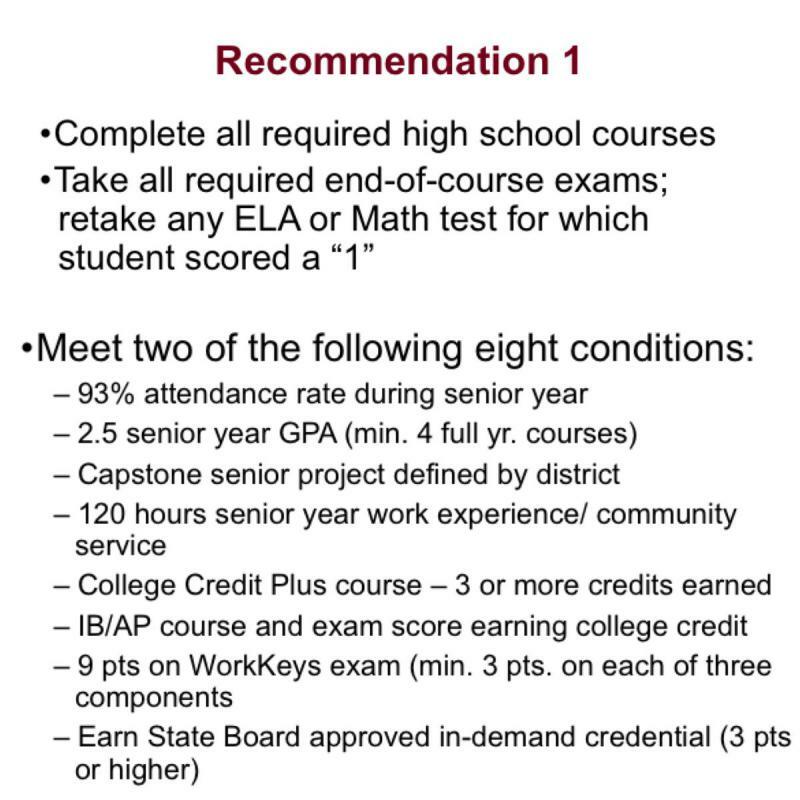 Recommendation 1 creates eight conditions from which students can meet two in order to graduate. This partners with the testing pathway available to students. Recommendation 2 offers other options along the career-technical training pathway. When you walk through the first floor hallway of the Ohio Department of Education building, it looks like any other office building. Open the door to the conference room and it looks like any other meeting happening around Capitol Square. 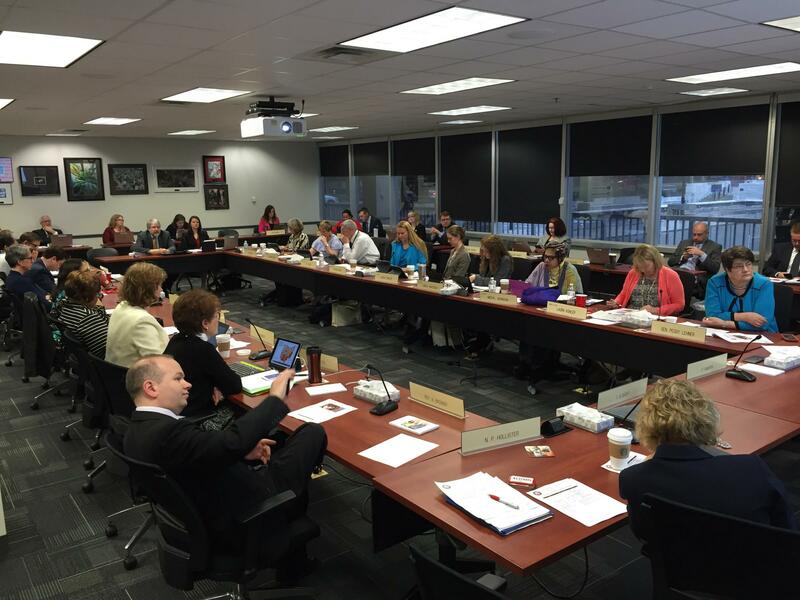 But this is not your typical meeting for the State Board of Education. This time, the futures of thousands of students are potentially on the line, as board members debate what to do with Ohio’s high school graduation requirements. In that room, at a circle of tables speaking to more than a dozen board members, State School Superintendent Paolo DeMaria mulls over what it means to provide a good education before presenting the board with two ways to help more high schoolers get their diploma. The current requirements ask students to get a good score over the course of seven different final exams or score well on the SAT or ACT. These more challenging new standards were developed just three years ago. 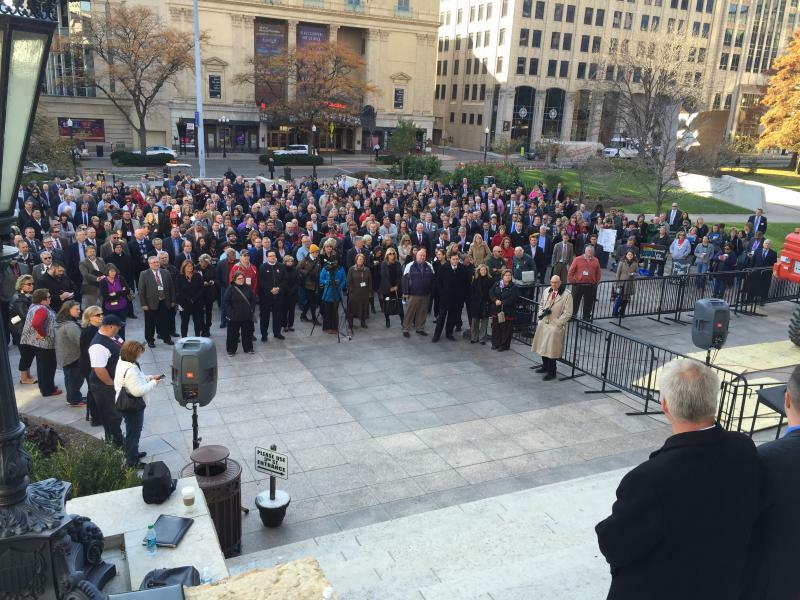 Many school leaders, from teachers to administrators, say the state has an impending crisis on their hands. As of right now, more than 47,000 high school juniors are not on track to graduate under those standards that go into effect starting with the class of 2018. “There is a certain urgency to making progress because, as was stated very well by superintendents and others who testified before this board, it’s important to give clarity to students who are about to finish their junior year and proceed into their senior year about what the expectations are,” said DeMaria. So here’s what DeMaria would like to see. Take the current standards when it comes to testing. But then offer eight other conditions for graduation and students would have to accomplish two of them. Those conditions include, attending 93% of their classes senior year, getting a 2.5 GPA, or completing an independent senior project. Republican Senator Peggy Lehner of Kettering is chair of the Senate Education Committee. She’s been following the looming graduation crisis closely and says these recommendations are an improvement. She says it’s important to have high standards so a high school diploma still means something, but softening them for the class of 2018 is only fair. “I think it certainly helps with the transition period there are just things that take time to adjust to -- a new test -- so we don’t want to artificially leave kids out of getting a diploma so I think it’s a very reasonable solution,” Lehner said. 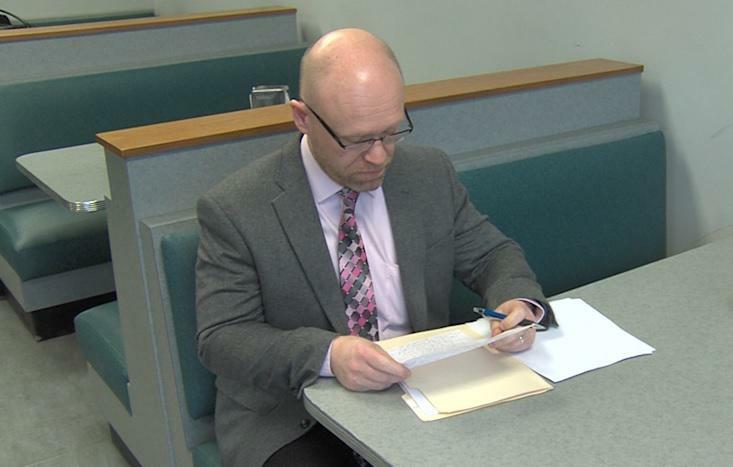 Shuffling through a stack of papers just outside of the conference room is Chad Aldis, who’s preparing to speak against the new recommendations. Aldis is with the pro-charter school group the Fordham Institute, which analyzes and researches academic achievement. He argues that offering conditions based on attendance and independent projects takes away from scoring students based on aptitude. “No academic requirements? No proficiency in math, language arts, social studies for graduating from high school and I think that will remove some of the incentive to try to get students to a higher bar, to get them to perform better, and try to prepare them for what comes after high school,” argued Aldis. Back inside the conference room, most of the state board of education seems to disagree with Aldis’ take. They voted to move the new requirements on to the next step. The board still needs approval from Ohio lawmakers in order to officially make those changes - which means the fates of many high schoolers in the state will move out of this conference room and over to the Statehouse for a new round of meetings to begin.